Currently, runoff from the Surf Street Drainage Management Area (DMA) is routed as surface flow to the west end of Surf Street. Here, the runoff is conveyed by pipe down the slope, where it emerges as surface runoff and enters a drainage inlet near the public restroom. A subsurface pipe then discharges the runoff to the Bay at the outfall. 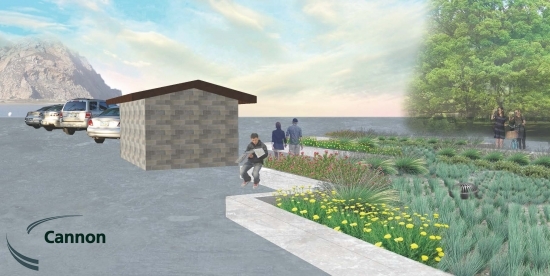 A raised planter box style biofiltration Stormwater Control Measure (SCM) would provide water quality treatment, public seating, and urban greening improvement on the waterfront. The design is intended to align with the proposed maritime museum. Runoff would be routed into the biofiltration SCM, infiltrated through bioretention soil media with treated runoff exiting the SCM via an underdrain. Two SCM footprint options were developed and Option 1, which seems sized appropriately relative to the surrounding uses, is provided on this template. Option 2 sizing, which takes advantage of the available space but is relatively large, is also provided as part of the project design deliverable package.